Normally, blog entries come to me easily. It might be prompted by a comment during the week, or be inspired by a particular problem I’m having. This week, however, I’ve been struggling to complete an entry. I started on the topic of swearing, then about gaps in your writing CV, then about third-person biographies, but none of these topics were going anywhere. I might return to them in the future, but today’s entry is about finishing what you start. like pirate vessels of the ancient past. instructed us to try the radio. she stopped us by the archipelago. the next we knew, the bow was pointing in the air. It knocked us to the deck. This needs a lot of work done. There are a number of options to breathe new life into it: cut out unnecessary words and phrases, continue to add verses, rewrite it as prose, recycle elements of it into other works, and/or cut it into individual phrases and shuffle them about. To make what became the response, I used some elements of this story, cut out a lot of detail and rendered it as prose. The final result mimicked the shipping forecast on Radio 4. I’ve done something similar for older pieces. Around 2011, I wasn’t writing much poetry and I thought what I had was quite a good piece. Four years later, I revisited it while answering a writing prompt and it wasn’t as good as I remembered. I took the same idea but structured the verse differently and I’m now happy with it. Some writers seem scared to finish pieces, as if they’ll think of a better word or structure as soon as it’s been submitted to a publisher. But if its publication you’re looking for, there comes a time when you need to let go of it. Remember there will be every opportunity to amend it if it’s rejected, and some publishers will allow – or insist upon – amendments if it’s accepted. I’ve been asked before how I know when I’ve finished a piece. That’s not an easy one to answer, but the best measure I have is when I stop thinking about it day-to-day. That’s when I leave it alone for a while, then revisit it with fresh eyes later on. It’s a good idea to finish what you start, at least to the best of your ability. If you see the perfect outlet for your piece, it’s much easier to tweak it than to have to add or remove significant portions. You might then be able to submit it comfortably before the deadline. That’s the place, uh-huh uh-huh, I write it. It strikes me that the solution is hidden within the problem: why stare at a blank page if that doesn’t help you produce work? Go and lie down in bed, or have a shower, or drive around town. But be sure to have a safe way of recording your ideas as they occur. The perfect spot for a writer is as individual as his or her work. I recently attended a workshop in a library. One of the organisers asked us to pick a spot in the building where we each felt comfortable, then to complete a writing exercise. Some participants preferred an open area, others preferred a little niche; one person lay on the floor while another nipped upstairs. For my own part, I found a shelf at chest height and placed my work on top of it. When I’m using my computer at home, I prefer to stand up with my back to my bedroom window; I’ve experimented with other places in the house but they simply don’t have the same vibe. It’s also timeworn advice to keep a notepad and pen by your bedside table in case a great idea occurs during the night. This has rarely worked for me; I find going for a walk for a walk, especially in the cold, is much more effective. Consider also the sounds around you. I was writing a play a few years ago that had a rather dark theme, and I found the only music that helped me write this way was Radiohead. Any other time, I listen to the soundtrack from the film The Assassination of Jesse James, written by Nick Cave and Warren Ellis. 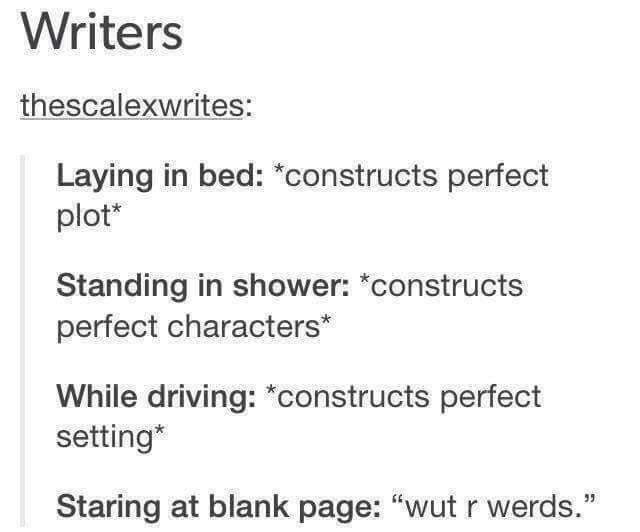 So be sure to experiment with your particular writing place. A lot of people believe that to be a writer you have to sit a mahogany desk for a set time each day in silence and write a certain number of words. That works for some people, but if it doesn’t do anything for you, find a method that does. Think of it this way: if you weren’t receiving your milk delivery, you wouldn’t complain to the postman. Similarly, if your current actions aren’t helping you to place words on paper, it’s time to take new actions. Patronising: that’s where you talk down to someone. We take the petrol to the pump so you don’t have to go to the refinery to collect it. I thought this rather insulted the intelligence of the audience. That’s how you might explain it if a child asked. But if you’re old enough to buy petrol, you’re old enough to understand what a tanker does. A friend’s daughter used to work in the media and often encountered this kind of tone. She brands it infantilisation. It’s timeworn advice not to think about your audience while you’re writing fiction, but I do think it’s important while editing. Let’s say your character plays a musical instrument. It’s probable your audience would know what a balalaika is, but would they be familiar with a theremin? Becky strummed her balalaika every evening, adding a fresh twist to popular rock classics. Jessica pushed down the door handle and pulled the door towards her. She stepped back as it opened and she saw Fiona in the room. Fiona was sitting in a chair and clasped in her hand a stack of £50 notes. When Jessica looked at her, she raised her eyebrows and opened her mouth wide, knowing she had been caught with the takings from the shop. Jessica entered the room. There was Fiona; £50 notes in her hand. The takings from the shop. “This is not what it looks like,” said Fiona. Notice in the second passage that the focus is on the actions that drive the plot forward. Here, the facial expressions are of little relevance to the story; the reader wants to know what happened to the money. The question of relevance is key to pitching your text at the right level. If anyone sees that oil truck, please pass on my comments to the company. Last week, it was announced that Colin Vearncombe had died after a car accident. He was noted for his hit single Wonderful Life under the stage name Black. Of all the musicians that died last month, this one had the greatest impact as I’d met him in April last year. He was performing in a pub with Callum Maccoll; no backing band, no gimmicks, just them and their guitars. The surprise of the evening was when he revealed he’d been asked to write a song for a young solo artist, but her career never took off. Instead, he started performing the song himself at gigs, complete with the chorus hook It would be so cool to be your girl. He’d also brought along books of his poetry, and I bought one on the night. He seemed a genuinely nice person who was grateful for his fans’ support. Altogether, it was probably the best gig I saw in 2015, and it’s saddening that it’ll never happen again. It’s well-worn advice never to meet your heroes or you risk being disappointed. I’m telling you the opposite: if you hear a favourite author is coming to town, go and see him or her. A few years ago, I was privileged to be part of an audience with Iain (M) Banks on two occasions. He was an extrovert who loved taking questions from his fans while ‘threatening’ them that he would keep talking if nobody put up their hand. Regrettably, I couldn’t think of a question to ask him on either occasion, although a friend did. In fact, go and see any author who’s nearby, whether or not you’re familiar with their work. Without having read their novels, I’ve met Roddy Doyle, Stuart MacBride, Irvine Welsh and most recently Paula Hawkins, plus many more. Out of dozens of writers, I can think of only two authors in whom I was disappointed: one of them simply parroted the contents of his book, while the other showed off with theatrics rather than being herself. The easiest way to know about upcoming talks and launches is as you might expect: search it online. Or if you’re in or near a major city, there might be a central point of information, such as Literary Dundee where I live. However you find out, my message is the same. Meet your heroes – while you can.